Comedy, Juggling, and So Much More. Want to make your event a truly memorable experience for your employees, clients or friends? Hire the most successful juggler in Las Vegas history. Michael has a hilarious show that will get your group laughing, guaranteed. Need to deliver your corporate or marketing message in a lighthearted, entertaining way? Michael can blend your message into a customized performance of amazing juggling and comedy. Your people will remember this show and your message in glowing terms. 2018 was my second year in the fair market and I’m loving it. Last year I performed 12 days at fairs. This year I did 68! The people and places have been kind and welcoming. If you’d like to speak to my representative, call or email Mark Sparks at Triangle Talent: (502) 594-1276 msparks@triangletalent.com He’s a good guy. You’ll like him. If you want to speak with me you can do that too: info@mikegoudeau.com, (702) 496-7702. I was the featured act in the Lance Burton Show in Las Vegas from 1991 until 2010, first at the Hacienda Hotel and beginning in 1996 at the Monte Carlo Hotel. Before 1991 I appeared in several different Las Vegas shows for extended runs including the Follies Bergere, Melinda: First Lady of Magic, Luck Be a Lady, Hitz, and Splash. Michael has performed more shows for more years than any juggler in Las Vegas history. I've also been lucky enough to perform on TV shows, cruise lines, comedy clubs and review shows around the world. 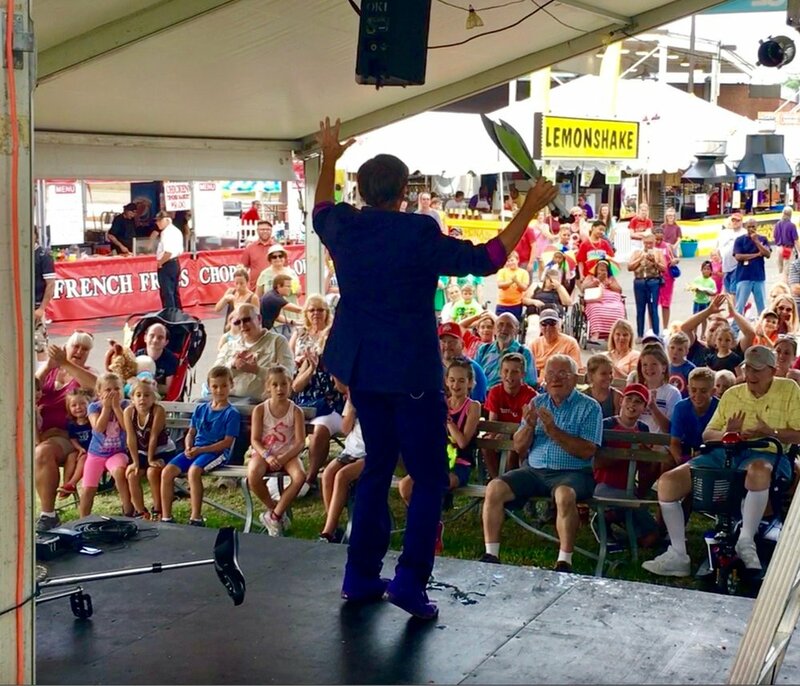 I've written and performed custom juggling shows for an amazing variety of clients from IBM to Old Uncle Gaylord’s Ice Cream parlor. My show has all the laughs of a great comedian combined with all the thrills of a great juggling act. This show isn't just someone talking about something funny that happened, its "funny" happening right now. Your crowd will love it. Need to deliver your message in a lighthearted, entertaining way? Need a crowd at your tradeshow booth? I can blend your message into a customized performance of amazing juggling and comedy. I can create magic tricks that match your message or deliver your product in a truly memorable way. People will remember this show and your message in glowing terms.